If you are looking for a splendid beach in Banten, there is Tanjung Layar Beach. The location is in Sawarna Village. It belongs to Bayah District, Lebak. The beach is located in the westernmost of Java Island. Apart from this fact, it becomes a recommended vacation destination for families. There is the presence of tons of caves nearby. They were formed naturally. Thus, visitors have the chance to explore them all wholeheartedly. If you want a merrier nuance, you should come on the weekends! The beach features two big coral reefs. They are similar to hills, actually. Also, they are covered by some bushes and small trees. The sky is quite clear in the hot season. In fact, it doesn’t show any clouds! No wonder, the water reflects clear blue color flawlessly. Some parts of the shorelines are shallow and surrounded by stones. The seawater is clear and beautiful. However, the other parts of the water are quite deep. Make sure to watch your feet when exploring it. The best time to visit the beach is on weekends. This helps you reach more tourists and visitors. In some way, it helps you make new friends. What can tourists do on the beach, actually? It is playing water. The sand is white and soft, as well. That means you can walk on it comfortably. If you come with families, you can conduct beach walking together. Don’t let your kids get too closer to the water, though. It is because the waves are considered quite big. The next activity is photography. Many spots in the beach are suitable for selfies. For professional photographers, there are many great objects to capture as well. Even many people call Tanjung Layar as a hidden heaven. 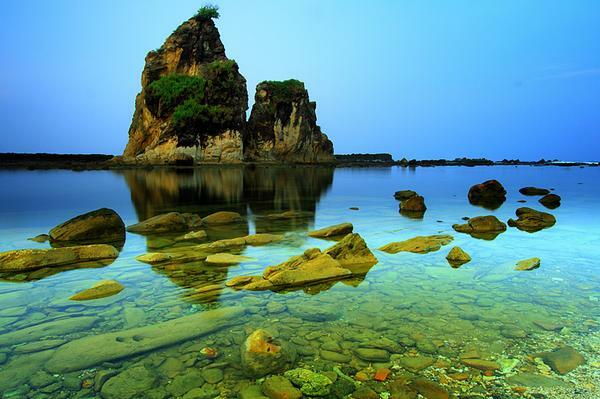 It is also a common tourist spot in Sawarna. If you love nature tourism, you should never miss an opportunity in visiting the beach. On top of that, you can learn history about it. The beach is named after two big coral reefs, which are similar to boat’s sails. The locals may tell you about the story regarding Tanjung Layar Beach. The legend has it. Those coral reefs were the sails of Sangkuriang’s boat. The owner became furious due to the rejection of a marriage. He kicked the boat and it became Tangkuban Perahu Mountain. The sails were scattered on this beach. Another attraction is the sacred ceremony at night. Local people perform a sacred ritual every Thursday night. The purpose is to appreciate the keeper of the South Sea. If you come at the right time, you are able to witness such activity. It is easy to reach Tanjung Layar Beach. From Jakarta, you can use the fastest route to Sawarna Village. It passes through several checkpoints such as East Serang, Pandeglang, Malimping, and Bayah. There is another route, actually. From Jakarta, you can head to Ciawi and reach several checkpoints such as Ratu Port and Cisolok. Both routes have the same final destination, which is Sawarna. Once you reach the beach, you can find several facilities such as restaurants and hotels.